The final project for this semester's MATH 297 - Knot Theory Research and 3D Printing course was to research and print a set of interesting knot conformations for the first fifteen knots in the Rolfsen knot table. The students recently presented their work at the Spring MD/DC/VA MAA meeting, and thanks to the Institute for Visual Studies these knots will be on permanent display at the entrance of Roop Hall, home of the JMU Department of Mathematics and Statistics. Knots are embeddings of circles in 3-dimensional space, but they are typically studied in terms of their projections into 2-dimensional space. 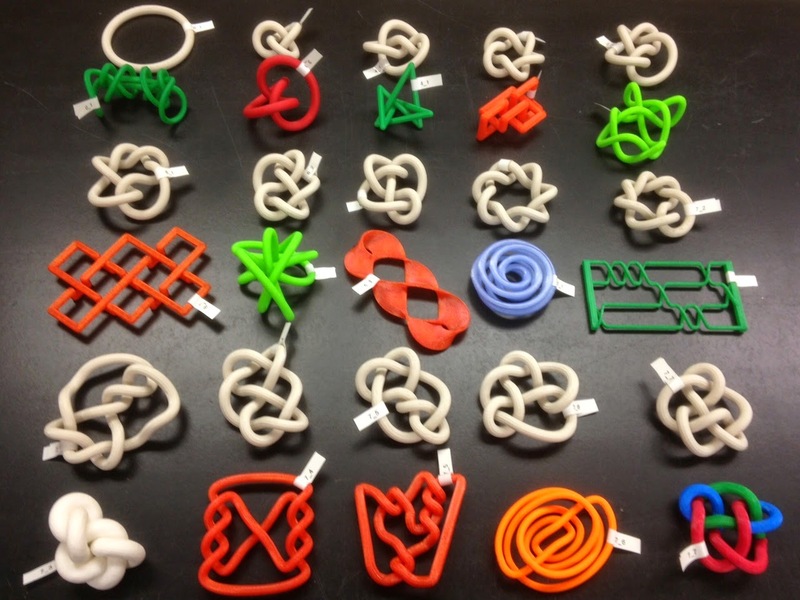 We can use 3D printing to study knots in a more 3-dimensional way. In this series we present 3D printed conformations of the fifteen knots through seven crossings, including stick, Lissajous, lattice, torus, petal, and pretzel conformations. Constructing a 3D model that is actually printable can challenging; to 3D print the knot conformations through seven crossings, we used a combination of Mathematica, Blender, Tinkercad, Knotplot, SeifertView, and OpenSCAD. Settings: All of these knots were printed on a MakerBot Replicator 2, with various choices of settings depending on the conformation design.